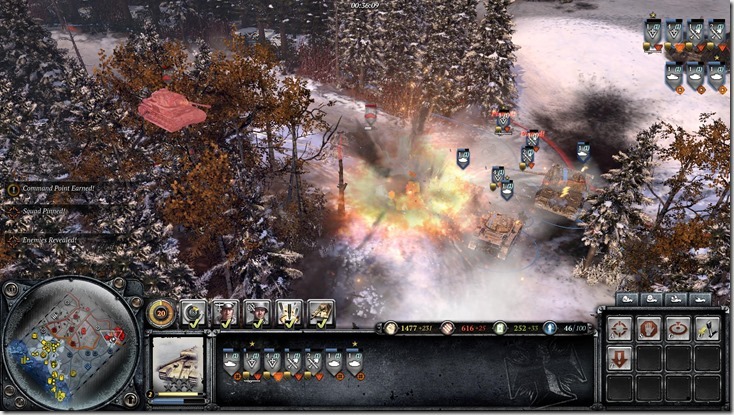 Company of Heroes 2 was generally quite well received on its release around a year ago. Many people wrote off the single player campaign as something which was forgettable. The multiplayer on the other hand, is where the game showed its real potential. Relic have put together The Western Front Armies, a DLC or expansion of sorts which has appeal to both those who own the game and those who don’t . You don’t need to own Company of Heroes 2 to play it, so for that reason, I have split this review accordingly. Which player are you? This package is probably the easiest way for a new player to get into the Company of Heroes franchise. A new player can choose to buy either of the new factions, the US Forces or the Oberkommando West, for $12.99. Both can be purchased for $19.99. Doing so will not let you access the original games campaign mode, but it will grant you access to the entire multiplayer side. There is no access to the factions from the core game itself. 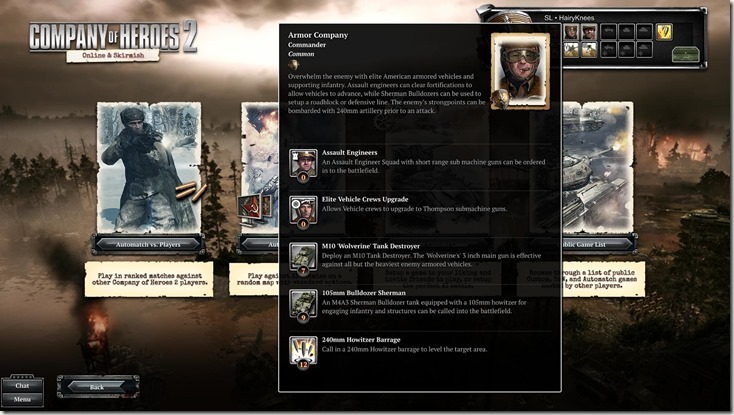 So what is Company of Heroes exactly? 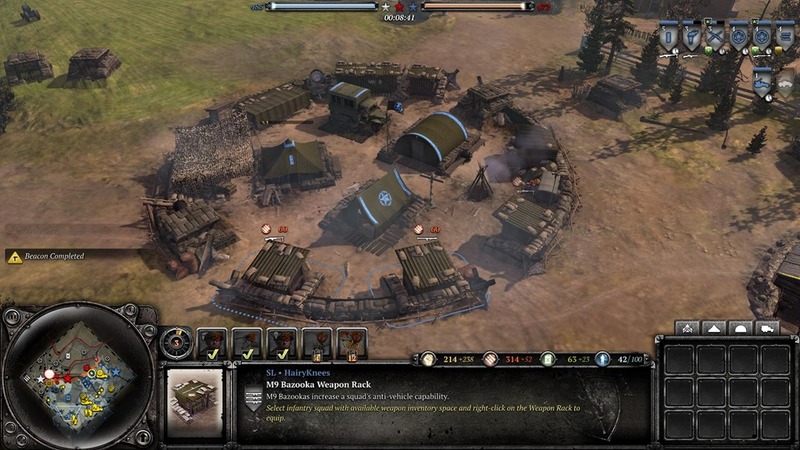 Simply put, It is a strategy game set in World War II. 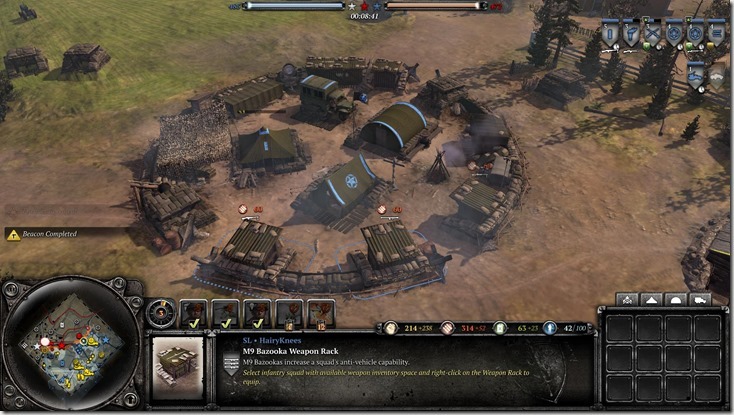 The player has access to infantry as well as armoured vehicles, all with their own strengths and weaknesses. The game play is flexible in the sense that a player must learn to use the environment around them, as well as play strategically to ensure they get the maximum use out of their resources. An infantry squad for example, can take cover in a building, giving them a much longer life expectancy when matched against an infantry squad out in the open. It’s still a dangerous position to be in however, as heavy weaponry can reduce the building to dust in no time at all. 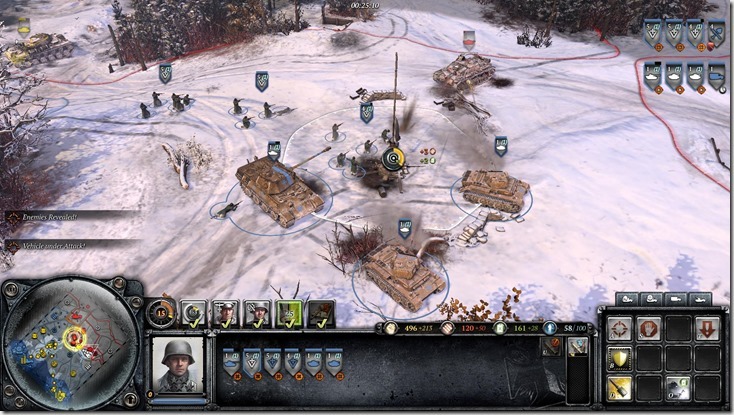 There are various game modes, but the core gameplay mechanic is essentially the capturing and defending of points. Owning a control point gives you a boost to your resource income, allowing you to deploy more units, use special support or offensive commands, and so on. The Victory Point win condition works on the basis of keeping control of the majority of three main control points. Doing so will slowly deplete your enemies points, and getting them to reach 0 will win you the game. Alternately, you can go for the classic Annihilation game mode, which as it says, sets you the goal of destroying your enemies and their headquarters. There is only one short tutorial which helps players understand just how the games mechanics work. Other than that, there is AI which should provide more than enough practice in terms of understanding how a faction works and what their strengths and weaknesses are. The game however, has a lot to it, and perfecting a strategy will most certainly take time and practice. If you are looking for single player, sadly, this package does not include any such option other than practice games versus AI. What is probably one of the nicest things about this expansion is that the community has not been fragmented. It is still possible to play against people who only have the core game, and vice versa. Owning a single faction will still allow you to play against enemies from others. If you’re a fan of the series, Western Front Armies may be the breath of fresh air you need to keep your interest in the game piqued. There are no new single player elements, and instead, the expansion/DLC focuses more on the multiplayer side of things. There are two new armies to command; the US Forces and the Oberkommando West. The US Forces are possibly the more flexible of the two. Starting out, their base is pretty much built, leaving them to go ahead and grab any nearby points as soon as possible. Unlocking stronger units and such however, first requires the player to call in an officer. The US Forces are strong in the sense that they are incredibly versatile with their infantry. Control points can be locked down, increasing munitions/fuel incoming, and it also makes it just that little bit harder for an enemy to take it. They also have access to paratroopers, which if used correctly, can be used to flank enemy positions effectively, or used to sneakily grab a control point while the enemy has their efforts focused elsewhere. The Oberkommando West on the other hand, are masters of armour. Their approach is something that is slower but more calculated. Their buildings can be deployed on the battlefield, and their defensive capabilities can be used to secure a point and delay any enemies approach. Their infantry on the other hand is limited when compared to the US. There is no question when it comes to their vehicles though. Their high tier vehicles are definitely costly, but incredibly scary when deployed. This is not to say that the US Forces don’t have access to any strong vehicles themselves, but infantry is definitely their strength when compared to the Oberkommando. Let’s not forget about all the different commanders on offer for each faction, which will slightly change how each is played based on player preference. The Western Front Armies also comes with a handful of new maps to play on. Personally, I am an extremely lazy RTS gamer, and I often go the old school “mass ALL the things” and right click across the map. This lead to the death of my armies, many, many times. 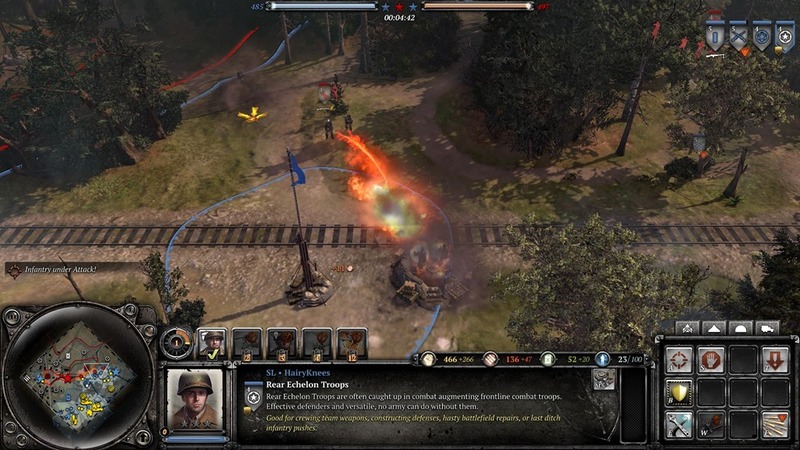 The environments are made to be used tactically, and this is seen in the maps on offer. I learnt the hard way, learning to utilise the detailed environment around me slowly but surely. You can purchase either army for $12.99, or buy both for $19.99. Regardless of what you choose to do, you will have access to the new maps. It seems a teeny bit steep to me. I feel it would have been nice if the factions were discounted for those who already own the game. 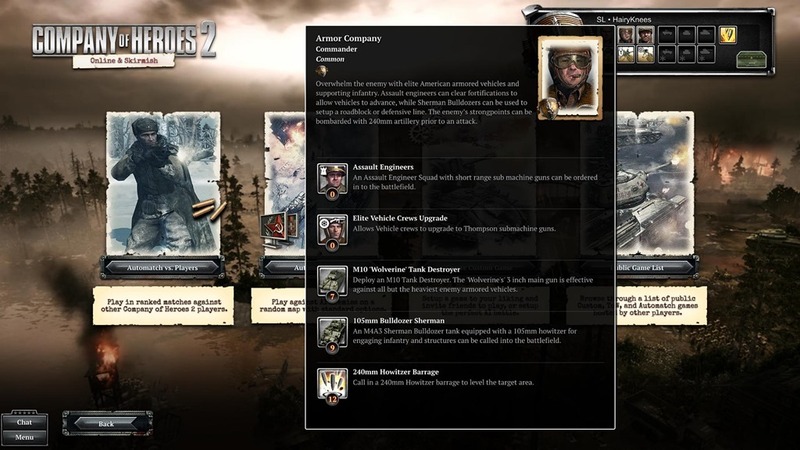 Comparatively, those who don’t have access to Company of Heroes 2 can buy even just a single faction, granting them access to the original multiplayer. There is no doubt that this expansion offers some great value to newcomers, offering them the whole Company of Heroes 2 multiplayer component for as little as $12.99. For those who already own the game, the new factions and maps will offer differentiation, but not a great deal of value. Previous article COMMUNITY is coming back for another season! Next article Behold the characters of BIG HERO 6!